Around this time last year, we featured a jailbreak theme by the name of Carla, which offered some well-designed, beautifully-detailed icons and aesthetics to the iOS 6 experience. Now, the developer has come through with a version for iOS 7, and although bears many remnants of the previous edition, looks even more polished and appealing this time around. Even though iOS 7 rather hastily dispelled virtually all traces of skeuomorphism, Carla hasn’t been so dismissive, and even though the latest and greatest version of Apple’s mobile OS is virtually flat throughout these days, Carla still finds a way to add some of the old without completely ignoring the new. As a result, you still get certain three-dimensional effects in some areas, but rather than feeling like a step back, the Carla design language rather complements the minimal visual elements of iOS 7, bringing a truly unique, aesthetically pleasing user experience. It offers a very polished, premium feel throughout, and with over 250 icons covering a broad range of both App Store and Cydia apps, it’s not one of those half-baked themes that forces you to hide dozens of app in folders in order to retain uniformity. The great news for previous users of Carla, is that the new theme is absolutely free to upgrade to, with no additional costs to bear. Moreover, if you’re enticed by the previews of Carla but have yet to make the purchase, you can do so right now for just $1.99, which is a promotional saving of one dollar over the regular $2.99 price. Please note, however, that this offer will only be running for a very limited time, so if you really do like the Carla theme for iOS 7, be sure to pick it up sooner rather than later. You will, of course, need a jailbroken iOS device in order to get started, but if you meet this prerequisite, then head over to Cydia right now and search for ‘Carla’. 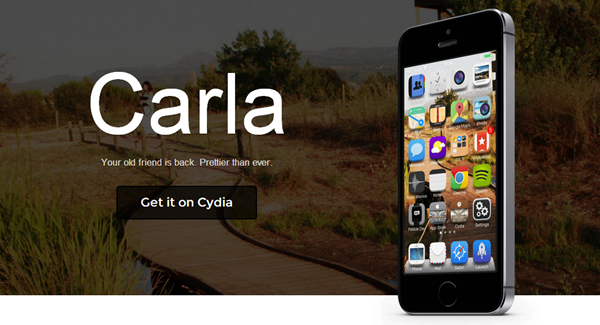 The theme is optimized for all iOS 7 devices, including the iPhone 5s, iPad Air and iPad mini with Retina display, so no matter what your poison may be, Carla is ready to offer her unique, sumptuous take on how things should look.